Making perfectly flat panels that look like they grew that way is possible by following just a few simple rules. For several years I was fortunate to live down the road from a logger. When he would come across a tree he drought might interest me, he'd give me a call. I'd excitedly put on my hoots and gloves and prepare for some intense hiking through rough terrain. The brush would snap and crack under our feet, and the thorns would snag our clothing as we trekked through woods and across muddy fields. However, in spite of my stash of lumber on steroids, there are still times that 1 need to glue several boards together to make a wide panel. Large tabletops, sides for casework and bottoms for drawers all come to mind. When 1 combine several boards to make a tabletop or other large panel, I want the finished panel to appear as one solid board as much as possible. After all, one of the many reasons I enjoy woodworking is because of the natural beauty of the material. I don't want to spoil the qualities of the wood by gluing together poorly selected boards with distracting mismatched grain and color. When selecting boards for a panel, you'll find that the best color and grain match comes from hoards sawn from the same tree. In fact, 1 prefer planks that were sawn consecutively. 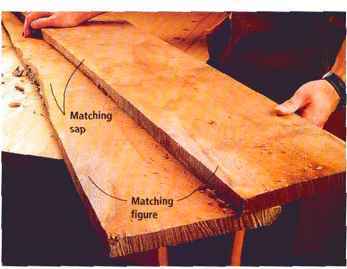 When gluing panels, you'll get the best color and grain match by finding boards that were sawn consecutively from a tree. Look for knots, bark, saw kerfs and other clues that the boards were next to one another in their previous life. Look carefully at the photos and you'll see a sap streak that is consistent. Sometimes the best way to find out if a board matches its neighbor is to look at the grain patterns. 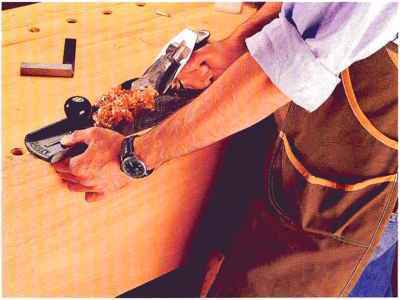 Take a block plane with you to the lumberyard to skim off a tittle of the rough-sawn stuff to get a look at the grain. As you sift through the stacks at lumberyards (be sure to ask permission and keep the stack near), look for defects, saw kerfs and width. Knots, worm holes and other natural defects will line up in consecutive boards. You also can look for short kerfs left over from the logger's chainsaw. As you spot boards with interesting figure, ser them aside and search for their relatives. Although it's not as easy to spor as knots or saw kerfs are, the grain pattern itself can be a gcKKl way to identify matching boards. 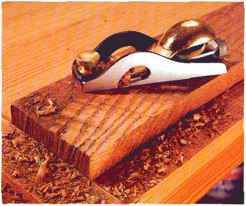 If you're looking at rough lumber you'll find it helpful to skim the surface with a block plane. 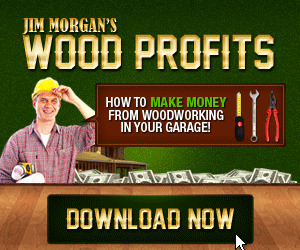 (However, to avoid being kicked out of the lumberyard, be sure to check with the lumber dealer before you try this technique.) Cutting two shorter lengths from one long board also can lead to a good match. But, again, ask for permission first. Be careful to match rhe figure along the glue joint. Some types of figure match well while others don't. There are many types of grain or figure. Cathedral grain and radial grain are most common. They're primarily a result of how the log was sawn; sawing "around the log" yields cathedral grain, while plain sawing (not rotating the log) yields boards with cathedral grain in the middle and radial grain along the edges. 1 prefer plain-sawn boards because it's easier to match the straight grain that appears along rhe boards' edges. Besides, boards sawn in this way typically are wider, and the resulting figure appears more natural to my eye than rhe figure from lumber sawn using other methods. 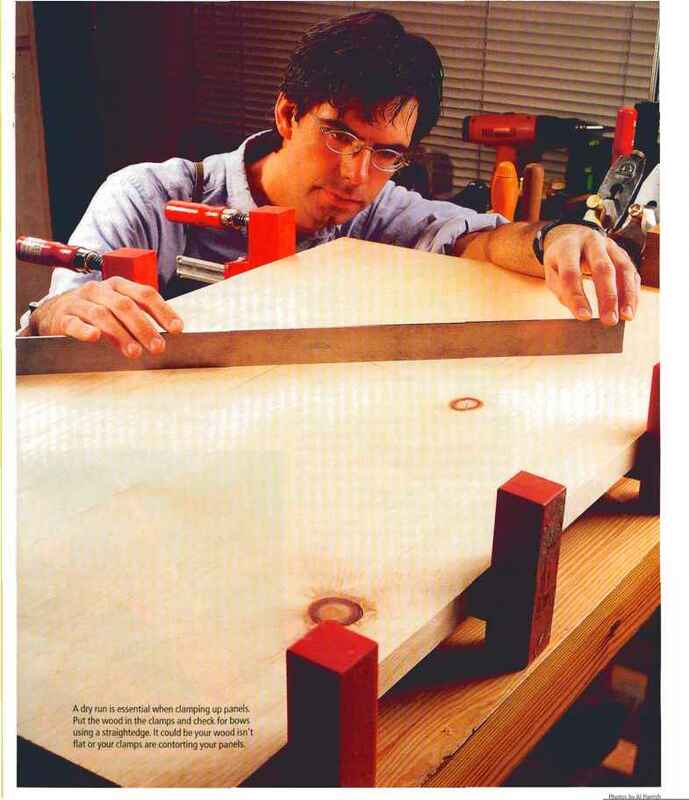 After carefully selecting the best boards for the panel, the next step is to arrange rhem in order for glue-up. My old high School woodworking textbook stated that rhe boards should he arranged so that rhe annual rings on the ends of each board alternate up and down. The idea was that as the boards cupped either direction they would keep the overall panel flat. This outdated idea typically results in a washboard surface with disjointed grain and color at all of the seams, which is why I don't do it. Instead, I arrange the boards for the best color and grain match, and I ignore rhe annual rings. Warpage isn't a problem because 1 use dry (pre-shrunk, pre-warped) lumber and allow it ro acclimate to my shop before milling it. Afterwards rhe construction of rhe piece will keep it flat. For example, a door panel is held flat by the door frame and a desk lid is restrained and held Hat by its two breadboard ends. Joint all your edges before gluing up a panel. Some people like to use a "sprung" joint that has a slight bow in the middle. I find it unnecessary. To create a flat glued-up panel, it's essential to begin with flat planks. And be aware that rough lumber is seldom flat. Neither is "dressed" or planed lumber, because it was not flattened on a jointer before it was planed. You can flatten the boards on a large jointer (I have a large 16" jointer for rhis purpose) or use a long handplane such as a «6, «7 or »8. But first, cut each board approximately 1" longer than needed. This will help remove some of the warp. After flattening one face of each board for the panel, plane the hoards to final thickness. Then joint all the edges of the stock and use care to ensure that rhe edges arc 90° to the face. To ensure strong, long-lasting joints in the panel, it's important that the edges are straight. Some woodworkers prefer that the joint is slightly concave; this is sometimes referred to as a "spring" or "sprung" joint. The idea is to place greater pressure at the ends to keep rhe joint right in this area if the ends dry out and shrink. Although a spring joint works effectively, I find rhat it isn't necessary. I simply joint the edges straight. However, convex edges should he corrected before glue-up. Otherwise they will introduce tension on the ends of the joint and it will most likely tail. While some woodworkers use a number ot devices such as splines, dowels and biscuits to strengthen an edge joint and aid with alignment, I simply spread the glue and apply the clamp pressure. 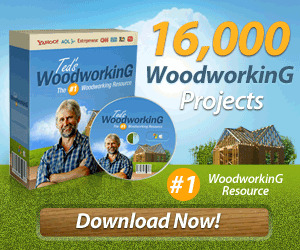 Edge joints don't need additional strength; the joint is already stronger than the surrounding wood. And aligning is a breeze; just gently push and pull on the boards as you tighten the clamps. 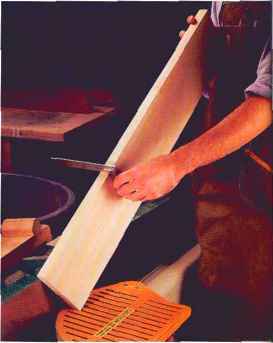 The glue-up procedure should he performed on a flat surface; otherwise you can glue a twist into the panel. Sawhorses work well, but unless the panel is extremely large I usually just work on my bench, which is large and flat. 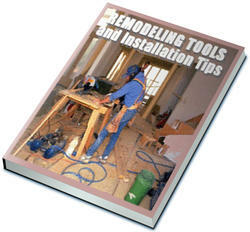 Beiore you begin, make sure that your clamps are straight; a bent pipe clamp also can cause the panel to twist. As I position rhe clamps, I alternate them over and under the work to equalize the pressure. I space the clamps approximately 12" apart; closer if the wood is very hard or there are more than two boards in the panel. If you don't own a jointer, a jointer plane, such as this #7, can joint a perfect edge. It takes a bit of practice, but isn't as difficult as you might think. I always perform a dry run to check the flatness of the panel and the fit of the joints before applying glue to the edges. Any potential problems are spotted easily in the dry nin anil corrected before the glue is applied. Before I disassemble the dry run I mark rhe pieces to ensure that 1 arrange the boards correctly during the actual glue-up, preventing unnecessary stress. When spreading glue you'll want just enough to wet the surface. 1 like to see a few drops ot squeeze-out; it lets me know that the joint isn't glue-starved. But too much glue leads to a big sticky mess and boards that slide out of position as clamp pressure is applied. I begin by clamping in the middle of the panel and work to the ends. I push or pull the boards at rhe ends until they're aligned at the clamp. Then I apply pressure to that area. Fingertips are quite sensitive and they can feel a few thousandths ot an inch ot misalignment. Once everything is aligned and all rhe clamps are in place I allow rhe glue an hour or so to dry. Then I remove the clamps and scrape away the soft beads of glue along the joint line. Once the glue has set, continue to work the panel to keep it flat. If left lying around, rhe panel can warp as the humidity changes.